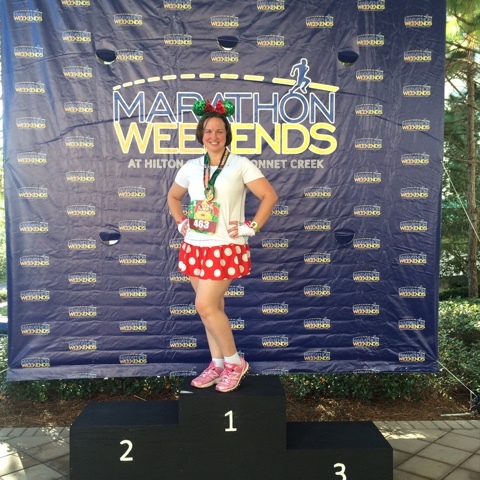 As part of the November 2015 Wine and Dine Half-Marathon weekend, runDisney also hosted Kid's Races and a 5K. Since we were making the journey to Florida for the half, my friend Craig and I decided to participate in Mickey's Jingle Jungle 5K as well. This made for a busy day of running as the 5K was scheduled for 7AM on Saturday morning and the half-marathon was set to begin at 10PM that same night. Since this was going to be my first half-marathon, I wanted to save my energy and my legs so we opted to take it easy on the 5K. 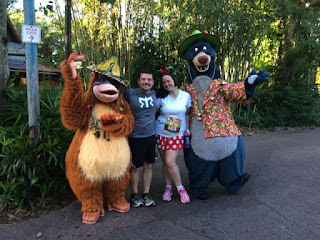 We stopped at all but one character picture along the course and jogged between the characters. 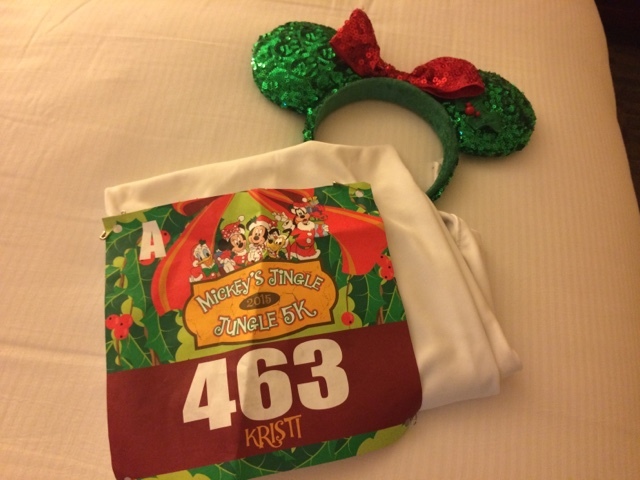 The 5K is also considered a fun run by runDisney and is not timed. Race gear ready to go. The course is entirely contained to Disney's Animal Kingdom. 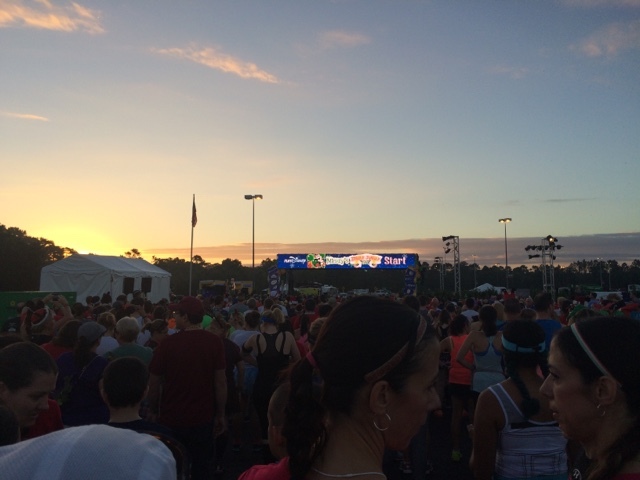 We arrived at the course around 5:45AM and there were already several thousand people gathered. Since we had about an hour to wait until we had to get into our corral, we joined the incredibly long line to wait for a picture with Mickey and Minnie. Well, after an hour wait and lots of conversation with the friendly folks around us in line, we still never made it to Mickey and Minnie and now it was time to head to Corral A for the start of the race. 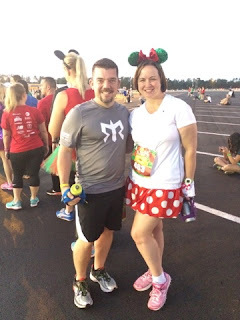 All morning long, the DJ entertained us with great music and now the announcers were taking over to welcome Mickey and Minnie to the starting line for the race to begin! Waiting in the longest line ever to hopefully see Mickey and Minnie. With a little Disney magic, flurries fell in Central Florida and we were underway. The "flurries" didn't do much to help the weather that day as the sun was rising with the start of the race and it was already in the low 70s with sweltering humidity. The course began looping around the parking lots of Animal Kingdom and you were almost a mile in as you entered the theme park. Once inside the park, runners raced towards the Tree of Life and followed the path to the left traveling towards Africa. 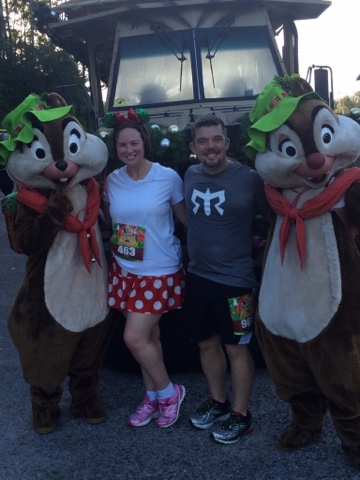 Flick from A Bug's Life was greeting runners just inside the Oasis, but we kept moving. 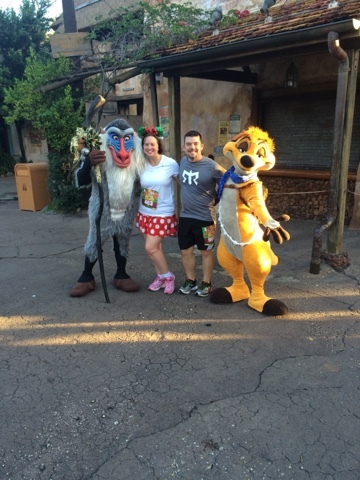 We did make our first character stop in Africa to say hi to Rafiki and Timon. 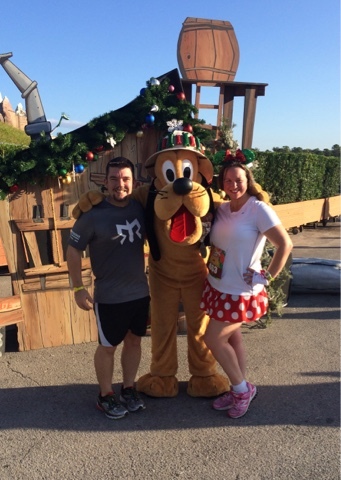 All of the characters along the course were decked out in their Christmas attire to usher in the holiday season. Rafiki and Timon were waiting to say "hi" in Africa! We then entered a backstage area behind Harambe and passed through to Asia where we found Baloo and King Louie. The rest of the course alternated back and forth between backstage and public theme park areas. We passed three more character stops including Chip & Dale, Pluto, and Donald Duck with Santa Goofy. The race used the same finish line that had been our starting point. Christmas Mickey and Minnie were on hand to greet finishers for pictures, but we didn't want to face the long lines again and were anxious to go back to our hotel for a shower and a big breakfast! A big smile for Pluto! Merry Christmas with Donald and Goofy! 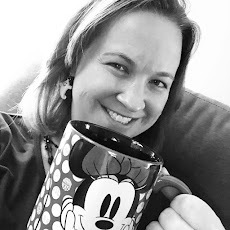 Even though Disney didn't time the race, my Garmin watch at has clocked in at a finish time at about 1:20 - that's right. . .well over an hour for a 5K! Along the course, we waited in line at 5 character stops and took one bathroom break. I didn't care at all how fast the run was as it was by far the absolute best 5K experience I've ever had! 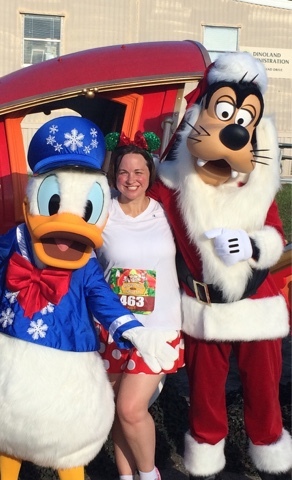 If you're looking to enjoy the fun of runDisney, but aren't a serious runner - don't be afraid to to sign up for the 5K. It's accessible to runners and walkers alike and will be sure to provide a fun morning that you won't soon forget! 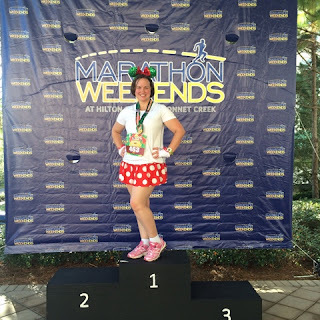 Back at the hotel sporting my new runDisney bling.